Today’s instruction was to work with an old map or create something that looks like a map. Rather than a traditional, geographical map, I wanted to work with a map of words and ideas. A mind map. 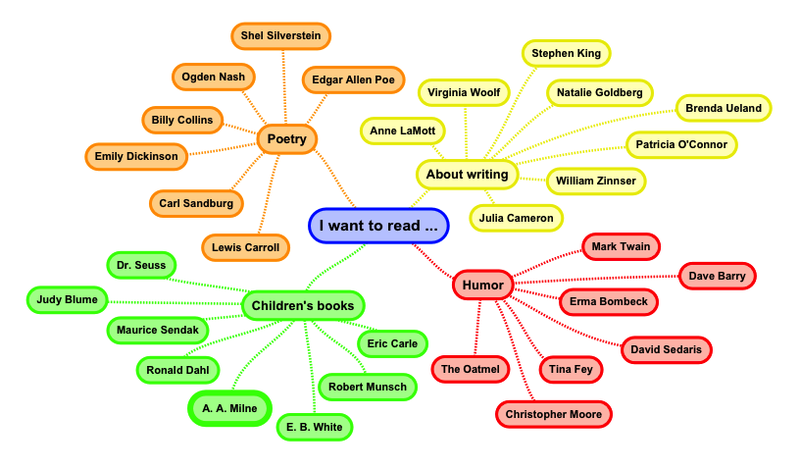 In my work, I use “mind mapping” to brainstorm and organize ideas. Normally, this activity requires nothing more than pencil and paper or marker and white board. But software and apps do exist to support the process. On my desktop, I’ve used MindNode with great results. Had I been home this evening, I probably would have called up MindNode for today’s make something task. But I was out and about. I did have my iPad, but didn’t yet have any mind mapping apps loaded there. So I swiped into the App Store and perused the options. A free app called Simple Mind+ rose to the top of the list. I installed it, and in moments I was creating a visual record of my ideas. Quick and easy. Because my husband and I were headed to the theater to see “The Butler,” I began brainstorming about movies. I named a few categories (Comedy, Romance, Drama, etc. ), then the various responses those genres might inspire in me (tears, hope, laughter, etc.). Then I started adding titles from my movie-going history. Mid-project, it was time for our movie. So I tucked the iPad away and immersed myself in “The Butler.” What a story! Provocative, stirring, troubling, yet hopeful. After the film, back in the car, I glanced again at my movie mind map. Following such a moving theater experience, my pointless map felt silly. I was compelled to map something more useful. But what? I recently set a goal to author and publish a book. I’ve not set a deadline, but my wheels are turning. One day, as I whined about not knowing what story I might tell, my sister suggested I write the book I want to read. I see a few signposts here. How about you? What path do you see for me in this mind map?